Biggest yet and truly international – but will you be there? This year, saw a record number of entries for The Loyalty Magazine Awards and on June 19th the biggest audience so far will be entertained, enthralled, elated (and possibly disappointed) as the winners are announced. But will you be there? “Never has customer loyalty been more important, and the excitement and buzz surrounding this year’s awards are evidence of this,” said a member of the judging panel. The Loyalty Magazine Awards, now in their seventh year, pay tribute to creativity, excellence, ingenuity and good practice in customer loyalty. They shine a light on the genius of the teams involved, and of the important role loyalty is playing in commerce of the future. The Loyalty Magazine Awards contains an outstanding group of Finalists for 2018. But which will be voted the best? Don’t you need to be one of the first to know? 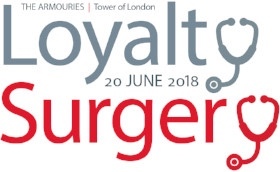 Then on June 20th, those lucky enough to have gained tickets, will be challenged, motivated and encouraged to ‘up their game’ by a world class programme of speakers and panelists at The Loyalty Surgery 2018. Being held INSIDE the Tower of London, in the atmospheric New Armouries, this is your opportunity to listen, learn, discuss, debate, challenge and network. Visit The Loyalty Surgery to see the action packed programme. Don’t miss this opportunity to engage with the world leaders in Loyalty. Contact us for some of the last remaining tickets for The Loyalty Surgery. Don’t delay. The clock is ticking, and your opportunity to attend these two special Loyalty events is disappearing fast. Join us for The Loyalty Magazine Awards on the 19th June at The Pavilion, Tower of London. Don’t delay, tables are understandably selling fast. Stunning location, excellent food and a wonderful opportunity to network! PLEASE NOTE: The shortlists for the four Regional Awards, and the Personality of the Year are not announced until the party night on June 19th, at The Pavilion, Tower of London. Make sure you are there! Currency Alliance (prime sponsor), Tranxactor (diamond sponsor), For Good Causes, Collinson Group, Givex (category sponsors), The Entertainer (take home bag sponsor). LoyaltyOne (headline sponsor), The Entertainer (gold sponsor), HTK, Ketchup, Sagarmatha, Motivforce, TLC (speaker sponsors).